This article is about the demolished train station. For the demolished MAX bus terminal, see Birmingham Central Station. The Birmingham Terminal Station was the primary passenger station for Birmingham from 1909 until rail travel sharply declined in the 1950s. It filled two blocks of 26th Street North (now Carraway Boulevard) above the 5th Avenue North underpass. Originally the main train stop for out-of-town visitors, as automobile and air travel came in to prominence the building was neglected, it was finally torn down in 1969. The exterior of the building was primarily brick. Two 130-foot towers topped the north and south wings. The central waiting room covered 7,600 square feet and was topped by a central dome 64 feet in diameter. The dome was constructed using the Guastavino system of layered terra-cotta tiles. At the top of the dome was a skylight of ornamental glass, lit from the openings in the cupola above. The bottom 16 feet of the walls of this main waiting room were finished in gray Tennessee marble. Connecting to the main waiting room were the ticket office, a separate ladies' waiting room, a smoking room, a barber shop, a news stand, a refreshment stand, and telephone and telegraph booths. Along the north and south concourses were the kitchen, lunch and dining rooms, another smoking room, restrooms, and the "colored" waiting room. The north wing housed two express freight companies while the south was used for baggage and mail transfer. Outside of the station were ten tracks. A series of overlapping "umbrella" sheds covered the platforms and tracks. These sheds provided protection from the rain while still letting in sunlight and fresh air. In the early 20th century, Birmingham was served by seven railroads. Six of these joined together to form the Birmingham Terminal Company which set out to develop a landmark passenger station. Acquiring property for the project, the company purchased First Congregational Christian Church and other parcels in 1905. The company hired Atlanta architect P. Thornton Marye, who would also design Highlands Methodist Church, to prepare plans for a majestic structure. His design was inspired by Beaux-Arts and Byzantine precedents and included a sixty-four foot diameter skylit dome over the 7,600 square foot waiting room, with the interior walls clad in Tennessee marble. In 1956 architectural historian Carroll Meeks described Birmingham's station as one of a group of "Burnham Baroque" edifices displaying the influence of World's Fair architecture. The exotic architectural style was somewhat controversial at the time. The station's construction took two years and cost $2 million. The first train to stop at the new platform, nearly two years before the station building was completed, arrived on the evening of June 30, 1907. Station master Lee C. Jones oversaw the first use of the telephone block signal system that guided the Southern Railway train to the south platform at 10:50 PM. On May 30, 1908 the Illinois Central Railroad line connected Birmingham to Chicago by extending the existing service from Jackson, Tennessee. A large crowd was present for the historic event. The grand opening of the Terminal Station building occurred on April 6, 1909. A balloon race and a parade, led by Grand Marshal E. J. McCrossin, were held to celebrate. In 1926 a giant electric sign was erected outside the station at the west end of the underpass. Originally reading "Welcome to Birmingham, the Magic City," it was later shortened to just "Birmingham, the Magic City." It deteriorated over the years due to lack of maintenance and was torn down in 1952, partly because the railroad station was no longer the primary entrance for visitors to the city. City Commissioner James Morgan recommended purchasing smaller signs to place at roadways and the Birmingham Municipal Airport. During the Depression, the station fell into disrepair, but in the late 1930s it again became an important transportation hub for the area and continued to be so through World War II. In 1943 the station got a $500,000 renovation which included sandblasting, new paint, and new interior fixtures. During this period of rebirth, rail traffic peaked at 54 trains per day. Rail continued as the primary form of long-distance transportation in America through the early 1950s. In December 1956 Carl and Alexinia Baldwin tested the station's compliance with an Interstate Commerce Commission ruling banning segregation among interstate passengers and were arrested on charges of disorderly conduct which were later dismissed. In January 1957, the Baldwins brought a lawsuit against the Birmingham City Commission, the Alabama Public Service Commission, and the Birmingham Terminal Company to desegregate the waiting rooms in Terminal Station. U.S. District Judge Seybourn H. Lynne dismissed the suit saying it was hypothetical. As a result of that ruling, Fred and Ruby Shuttlesworth again challenged the segregated waiting rooms at the station on March 6. Having announced their intentions in advance, a heavy police guard was present and despite drawing a crowd of angry whites, the couple were able to board their train without incident. However, Lamar Weaver, a white integrationist who had greeted them in the station, was assaulted after being forced to leave the station by police before he could escape in his car. The Baldwins' case was later appealed to the Fifth Circuit United States Court of Appeals and reversed in January 1958, sending it back to Judge Lynne. In November 1959 he again dismissed the case saying that none of the defendants were "denying or threatening to deny Negroes equal privileges". Appealed again, the Court of Appeals in February 1961 declared that segregation at the station was "in violation of the Fourteenth Amendment and the civil rights act," and ordered the District Court to remedy those practices. Judge Lynne therefore enjoined the three organizations from requiring or even compelling segregation based on race at the station. The Terminal Station in the background of a December 9, 1968 photo of site work at the new Birmingham Post Office. As automobile ownership increased and air travel gained popularity, rail travel suffered. By 1960 only 26 trains per day went through Terminal Station. 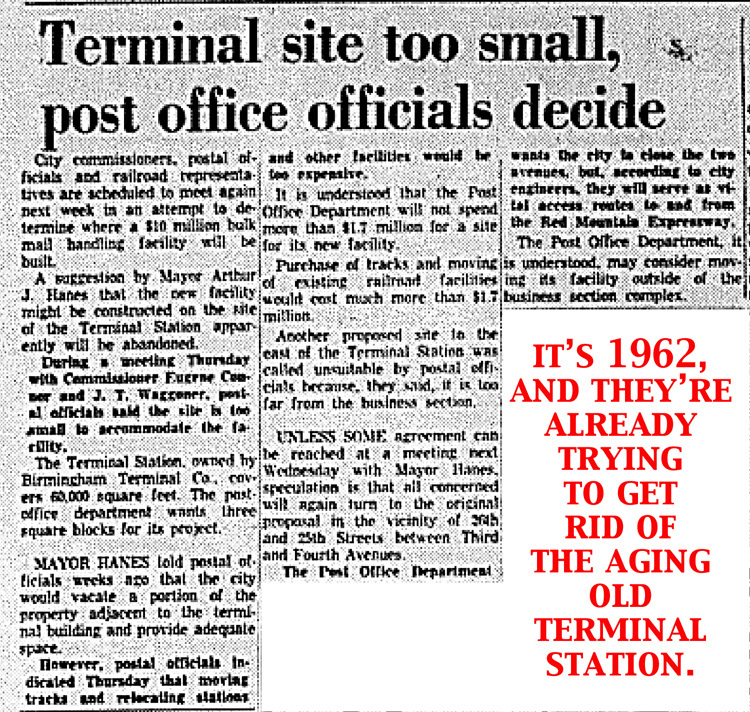 As early as 1962 the Terminal Station site was being proposed for redevelopment. Mayor Art Hanes and the Birmingham City Commission offered adjacent city-owned land as part of a proposal to construct a $10 million U.S. Postal Service bulk mail handling facility on the terminal site. In that instance, postal officials determined that relocating track and train facilities would be too expensive. By the beginning of 1969 only seven trains still served the station daily. It was then that the U.S. Social Security Administration announced plans to build a consolidated service center in downtown Birmingham. The announcement followed an executive order from President Richard Nixon mandating that all new federal offices be constructed in urban areas as a bolster against urban blight. William Engel of Engel Realty approached Southern Railroad, then the sole owner of the station, with plans for a $10 million project on the land occupied by Terminal Station. The plans called for a new, smaller station to be constructed along with the Social Security building, two other office buildings, and a large motel. It was estimated that the redevelopment would create about 3,000 jobs, but would necessitate tearing down the bulky Terminal Station. Those plans were generally unknown to the public, as well as to city officials, until shortly before the railway applied to the Alabama Public Service Commission for permission to demolish the building. On June 30, 1969, the commission approved demolition of the station, despite efforts by some groups, such as the Heart of Dixie Railroad Society, the Alabama Historical Society, the Women's Committee of 100, and a few local architects to argue for its preservation. The Railroad Society's Gilbert Douglas was quoted as saying "Birmingham didn't have much by the way of history to start with, and even though some people look upon the building as a monstrosity, it could be a major tourist attraction." Warner Floyd of the state historical society concurred, estimating the the station represented "20 percent of the architectural heritage assets of a city of three-quarters of a million people." Despite the pleas, the commission stated that it only had authority to consider the necessity and convenience of the traveling public, which the station clearly no longer served. Demolition by the T. M. Burgin Demolition Company began on September 22, although the main terminal was maintained until the new, smaller terminal building was built nearby. By December the station's land was completely cleared. Expressing regret for the loss afterward, Mayor George Seibels said, "We just didn't have enough information to try to coordinate the various interests that would have had to come together to save it." The Social Security Administration building was ultimately built elsewhere, but the now cleared land solved another problem the city had had. The original plans for the Red Mountain Expressway involved the destruction of 100 to 150 of the Central City Housing Project (now the site of the Park Place Hope VI project). With the Terminal Station gone, the expressway could be routed slightly to the east, avoiding the projects. The portion of the expressway going through the former Terminal Station property was not built until the late 1980s. A 7.32-acre section of the former station site lying to the east of the expressway was put on the market by Norfolk Southern in 2011 with an asking price of $2.7 million. Because of the Terminal Station's destruction, it is now often used as a rallying cry for local preservation groups. Whenever an historic Birmingham structure is threatened, those involved in trying to preserve it often point to the Terminal Station as an example of what Birmingham has lost in the past. This page was last modified on 17 February 2019, at 08:19. This page has been accessed 53,981 times.